When it comes time to buy real estate, we all worry about prices and financing. Seven important new factors that may help you decide if a home warranty is worth it. 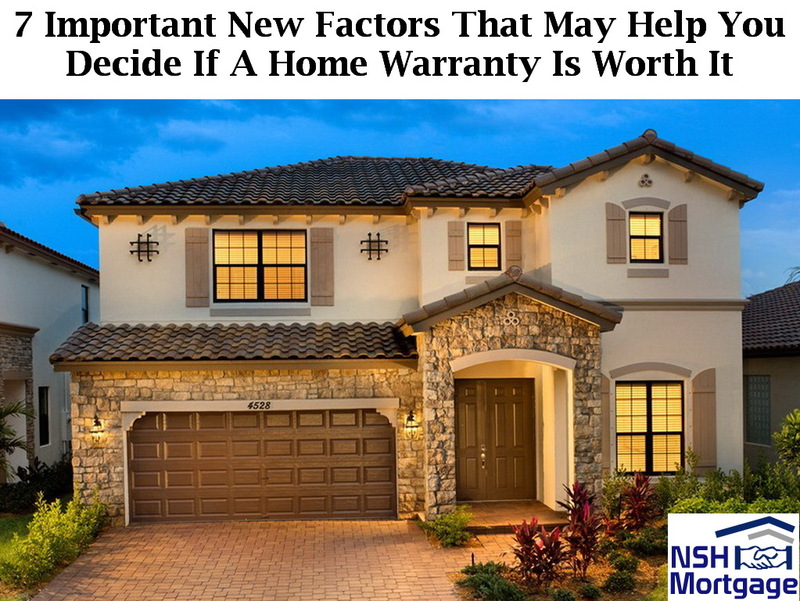 NSH Mortgage has the wisdom and tools that can help you with deciding if a home warranty is right for you when buying a home. But what about a home warranty? That is a piece of the puzzle which is often overlooked, much to the buyer’s lament. If we think about a home in the sense of it being a product, then we would like to know that our product works. In practice, once a home sale is over and the property settles, it is ours. The seller rides off into the sunset and no longer has a responsibility for repairs unless we want to get into a time consuming legal wrangle. We can offset some of the risk of condition in several ways. First, as a condition of buying the home, we can require a professional home inspection satisfactory to us. If we do not like the inspection results, the deal is off. Second, if we buy a new home it likely comes with a ten year warranty. Actually, some of the warranty is for ten years but not all of it. There might be ten year coverage for major structural items, two years for the electrical and mechanical systems, and one year for workmanship. In addition, new components like the heating and air conditioning system, refrigerator, or garage door opener may have their own warranties. However, with existing homes, there may be little or no forward protection. Indeed, homes can be sold in as is condition. Caveat emptor (buyer beware) is the practical standard for existing homes. Third, we can get a home warranty. The seller may refuse to make the repair. The quality of the repair may be questionable. The seller in bad faith simply will not honor the promised repair. We may have to sue the seller to get promised repairs. The cost of the suit may be greater than the repair bills. It may take a long time to wind through the court process. The seller’s promise is effectively unenforceable. With a home warranty, these problems disappear. A warranty, says Successful Real Estate Negotiation, represents guarantees, promises, and protections provided by one party to another. In real estate contracts, there are usually warranties regarding the condition of the appliances and certain fixtures. New homes often have extensive warranties covering not only fixtures and appliances, but the overall structure of the house as well. There can be express written warranties, implied warranties that guarantee that the parties intended. Even though, they may not have stated them specifically in the contract and imposed warranties. The importance of a home warranty is that if a seller or builder is no longer in the picture, or unresponsive, a strong third party is there to make promised repairs. While you can buy them yourself, homeowner warranties are typically available from owners when a home is for sale. They provide reassurance for buyers and that feeling can have value to property owners. According to a 2014 study of American Home Shield Study, a major provider of such policies, Homes sold with one of the company’s home protection plans spend an average of almost 11 less days on the market and sell at a sales price that is an average of more than $2,300 higher than homes sold without a home warranty. An one year policy is standard. What is the difference between a homeowner warranty and a homeowners’ insurance? Homeowners insurance covers the homeowner against sudden and accidental damage from perils such as fire, wind, flood, and so on. A home warranty covers a specified package of home systems and appliances from defects in materials and workmanship. Can the coverage be extended? As a buyer you might want this option, but be sure to ask about pricing. Better, negotiate for two years of coverage if you can. Different policies from different companies may cover different things. For details ask what the policy includes, and what is specifically excluded. Can I choose the company making the repairs? You can certainly suggest a repair company to the service contract provider but ultimately this is their decision. Whether you call it a deductible or co-payment, there is usually some charge per service call. The purpose of the deductible is to shield the warranty company from little tiny ticky tacky repair requests. That is understandable, however the deductible applies not to the overall policy but to each claim. This is a mixed bag. If you have the five claims there might be $500 in deductibles. On the other hand, if you have the five claims $500 may be a bargain. It is a debatable question if buying for yourself, but if a seller or broker is paying the tab then there is every reason to get one. Indeed, insist on it. If you worry about budgeting for unexpected and costly home repairs, a warranty that helps you sleep at night may be well worth its cost.